In 1968, the World’s Fair was held at San Antonio’s HemisFair Park under the theme “The Confluence of Civilizations in the Americas,” which celebrated the many nations that settled this region. The Junior League of San Antonio partnered with HemisFair on several projects and provided volunteers to man some of the most essential stations. 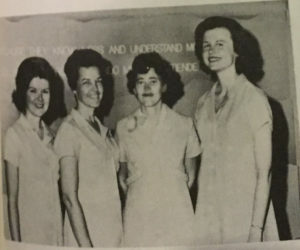 As members of the Multi-Lingual Fair Ladies Corp, some JLSA members served as VIP hostesses that escorted VIP visitors on tours and were trained to handle emergencies “gracefully.” Many VIPs included foreign dignitaries and heads of state, including our very own President Lyndon Johnson. It is hard to say exactly which VIP guests our JLSA members escorted, but we can only imagine it might have included such people as Princess Grace Kelly and Prince Rainier of Monaco, Bob Hope, or Louis Armstrong—all of whom visited San Antonio during this time. 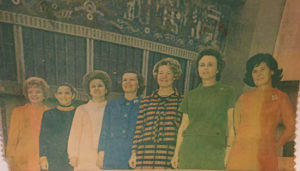 VIP hostesses pictured above include Mrs. Charles Becker, Mrs. William Gonzales, Mrs. Jose Benavides, Mrs. Frederic Oppenheimer, Mrs. George Kampmann, Mrs. Frederick Hanau-Schaunburg, and Mrs. Reginald Rowe. JLSA members also were feature participants in the Woman’s Pavilion and Traveler’s Aid. Approximately 60 League members served as guides and set the example for leadership for others to follow in the Woman’s Pavilion, while the Traveler’s Aid volunteers assisted visitors with all kinds of emergency situations such as lost children, injuries, and illness. 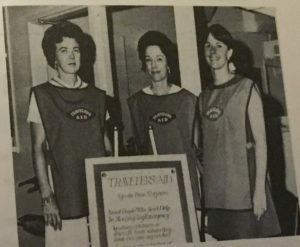 Pictured above are JLSA members that worked in the Woman’s Pavilion Barbara Burns, Ellanore Sledge, Shirely English, and Sara Jane Warren. Pictured below are JLSA members that worked in Traveler’s Aid Sally Berry, Jean Braley, and Courtney Walker.